Hey, I’d say so. It is important to note that the introduction of GE crops (in particular) has enabled wider adoption of “no-till” farming (see a farmer’s perspective on this). No-till is a system which conserves soil moisture, prevents erosion, dramatically reduces nutrient and pesticide movement to streams and rivers, and reduces fuel use. All good, in my opinion. Did you know that if we still farmed using the inputs and techniques that we did in the 1950s, we would need 2 billion more hectares available to produce what we produce today? Advances in plant breeding techniques, introduction of no-till practices, integrated pest management and adoption of genetically engineered crop varieties account for this rise in production. This translates into higher productivity on less land. We all win. If that’s the case, then how do you explain this interesting fact? Cotton farmers in India spray heavily to control for pests that damage production. Did you know that the application of pesticides to cotton in India is done by hand? With farmers walking through their small cotton fields using backpack sprayers? The adoption of GM cotton in India has reduced the number of pesticide applications per season by 50%. It is estimated that more than 2 million fewer cases of pesticide poisoning are occurring on an annual basis which saves the Indian government US$14 million (Smyth 2013, Herring 2009). Want a first world perspective on the whole GM and pesticide use issue? Check out Applied Mythology‘s “The Muddled Debate on Pesticides and GM Crops.” Pesticide use is lower. Combine that with other economic and environmental benefits (refer to #1 and #2)… it’s a good thing. I mentioned the “baby” and the “bathwater” already, didn’t I? Farming is complex. I don’t know ANY farmer who is not up against making a hundred decisions in a given day. Just ask a producer (grain, livestock, organic, conventional): Ryan Goodman, Brian Scott, Emily Zweber, Carrie Mess… Again, this is not an all or nothing scenario. Many factors go into the strategic management at the farm level. And its never as simple as saying that GMO is ‘bad’ and organic is ‘good’ or vice versa. It’s more than just picking a production method. I hear this a lot and I have to remind everyone that nothing is 100% safe. Nothing. NO food. You can test organic, conventional and GM for the next 500 years and there will never ever be “absolute proof” that a food produced a certain way is 100% safe. That’s not how things roll here in the ‘real world’. The food value chain is long and involves lots of actors. Lots can happen. Take for example the Maple Leaf Foods listeria crisis in 2008 (23 confirmed deaths). Then there was the XL Foods e.coli incident in 2012 where 18+ people were taken ill when they ingested tainted meat. And the anti-GM folks get a bit hot under the collar when I mention this one: almost 4000 people were affected and 53 died from a rare strain of e.coli in sprouts that were produced on an organic farm in Germany in 2011. There has been some food-related tragedies. 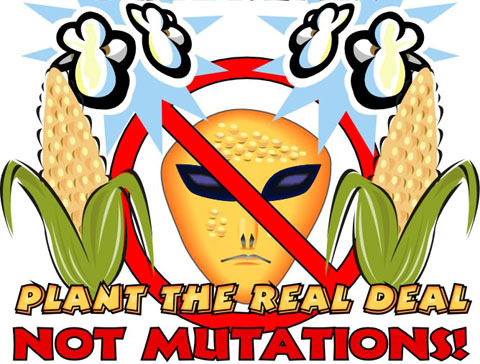 But there is no documented evidence of harm to human health or deaths from consumption of GM foods since they were introduced to the market two decades ago. None. Here are TWO studies (US and EU – and there are more) that attest to the safety of GM foods (NRC 2004, EC 2010). GE crops or GMOs have been the most heavily tested food products in the history of our regulatory system. I wonder who thought this little gem up. GM foods aren’t “hidden.” And they are certainly not “hidden” in animal feed. Livestock producers use corn and soybean as a base for animal feed, all over the world (including the the European Union where GE soybeans are exported from the US and Brazil for animal consumption). As of 2012, there has been a 100-fold increase in the planting of biotech crops since 1996. In the US alone, between 67% and 94% of all acreage attributed to corn, soybean, cotton and canola are genetically engineered. Nothing is “hidden” here… genetically engineered crops are ‘front and centre’ in world agriculture production. Biotechnology is the fastest adopted crop technology in the history of modern agriculture (James 2012). Wow. That sounds scary. Yes, GM seed prices are higher than that of conventional seeds. But farmers that utilize the technology get higher yields and extract higher margins from doing so. Just ask Brian Scott: “I can get a premium price for the soybeans we grow to be used as seed by other farmers next year.” If you ask Brian, he is neither “dependent” on the technology nor is he a “slave to ‘big ag’”. Rather he (and other producers like him) are making economic decisions at the farm level based on input costs and projected market outcomes. And don’t kid yourself. These folks don’t make these decisions at the expense of the land. They *care* about the environment (environmental benefits: see #1). They are not about to willfully destroy land that has been farmed by them and their ancestors – and potentially their children and children’s children – for generations. There’s that word again – – – “contamination”. It’s an ugly word with ugly connotations. Did you know that we already operate in a segregated agriculture and food system? If you want, you can choose to eat organic. It’s all labeled in your grocery store. Organics standards were adopted by the Canadian Food Inspection Agency in 2009 in Canada. These standards are enforced by organic inspectors through accredited certification bodies all over the country. Contamination? Organic farm and crop certification is based on the production methods used, NOT on the purity of the end product. So, nothing would happen to an organic grower or his produce if (in the highly unlikely event that) trace amounts of some other variety were found (BTW – there is no testing in organic crops). Organic growers will never lose their organic certification (unless, of course, they are shown to be intentionally growing ‘non-organic’ produce or crops and sending them to market as ‘organic’). Don’t believe everything you read. Syngenta, Dow, Bayer, Monsanto and other ‘big ag’ companies are just that–companies. They are profit-motivated and generate revenues to cover the costs of doing business and to provide a return for their shareholders. These companies, and others like Apple or MicroSoft, make no secret of that. And isn’t that the tenet of any business – big or small? Companies step into the space where the public sector can’t and won’t – they bring the products downstream to the market. Did you know that the time that it takes to put a product through the regulatory system has almost tripled in the last 20 years (13 years and $140 million US)? And just to clarify, the regulatory system is no more robust than it ever was. But the political pressures that have been placed on governments by interest groups (anti-GM) have forced a ‘slow down’ in the regulatory process. This means more costs. And, right now the only companies that have the resources to navigate the costly and complex regulatory processes are Big Ag. The whole “David and Goliath” thing (small defenseless farmer vs big ag company) gets wayyyy overblown in the anti-GM rhetoric. Like I said before, don’t believe everything you read. Like ‘em or not, ‘big ag’ companies are the only ones that can take these technologies to the marketplace where society can extract value from them. Who else? Universities and public research institutes? I don’t think so. At least, that’s not where I *want* my tax dollar going. These multinational ag businesses invest the dollars in the research and product development and they have a right to protect that investment for a limited period of time. It’s how our patent system works – for EVERYONE. Want to know more about patents and plants? Check here. On a final note: For every 10 reasons cited suggesting that we don’t need GMOs, I can list 100 or more of why we *do* need genetically engineered crops and GM food. Huge cheers from this direction!